When it comes to history, not much survives in Las Vegas. The Sands where Sinatra and the Rat Pack made their magic was demolished years ago. The original Aladdin where Elvis and Priscilla exchanged vows was leveled to make room for a bigger resort in the 90's. So for a simple Las Vegas wedding chapel to stand in the same spot for over 70 years is nothing short of amazing. 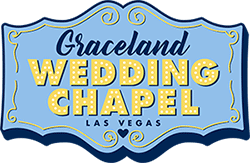 Graceland is one of the very few offering a full-service wedding facility offering fresh flowers or lifelike silk arrangements, limousine service, on-site photography, DVD video production of your wedding and more. Please stop by, call or email so we can give you the additional information you may need prior to getting married. We look forward to being of service to you.